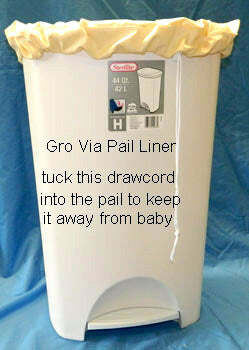 GroVia Diaper Pail Liner. Nice and huge. 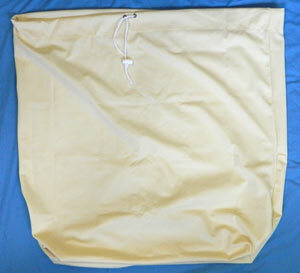 This is a large full-size pail liner with a drawstring. about 25 inches wide by 27 inches tall. It only comes in the color vanilla. It opens wide at the top for easy loading and unloading. As for all of the pail liners that have drawstrings please be sure to tuck the drawstring into the pail. It tucks in easily out of sight and out of reach. You don't want to leave cords dangling in baby's reach. This is nice and durable and is at a slightly lower price point for it's generous size. Karen's favorite pail liner because it is the easiest to wash since it opens up so wide at the top. The wide opening helps it not get a puddle inside it as easily in the machine since it can flatten out more easily for washing. I tend to prefer things that are the easiest to wash overall. 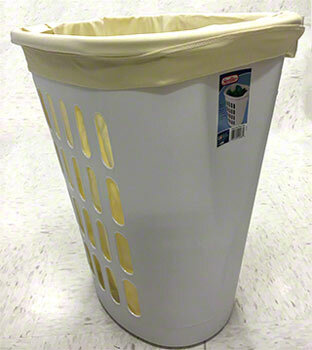 It is not seam-sealed like Thirsties Pail Liner which wins for waterproofness, but it functions just fine in a diaper pail, which is keep the inside of the pail from contacting the diapers thus decreasing the need to scrub the inside of the pail, and of course for transporting the diapers to the washer. Learn more about pail liners and see pictures. If you are looking for the largest size pail liner we know of, this is it. I love that the drawstring ACTUALLY SLIDES! Most of the others really don't slide very well or have a sewn down elastic top, but this one slides quite well. Pail not included. Easily fits pails that are made for regular 13 gallon tall kitchen garbage bags or a tall hamper. Allow air circulation. Love how easily it slides opens and how large the top is. very good quality! We love it. Works a lot better than the blueberry brand pail liner. Grovia Pail Liner is perfect! I love this liner. Fits perfectly in my tall laundry hamper to serve as a diaper pale. I throw it in to wash with my diapers and it’s been so much easier than having to constantly be sanitizing my pail. I did buy two so I can put the new one in while the other is being washed and would highly recommend doing the same. Very sturdy, wide, and even beautiful. Should have bought two. I just purchased this for my trade-out liner. Features I like: 1. No elastic on the top. One of our previous pail liners had elastic on the edge. When it was stretched out to accommodate our wide pail, it created some wear and tears in the PUL. The old one which had no elastic had no wear, so it was not simply from resting on the pail edge. The elastic doesn’t last as long by default when used with an indoor dryer, and it takes longer to dry. We use line drying by default, but can’t always. 2. The inseams are very sturdy and triple sewn. This is usually not something I would notice, but when these bags are retired from diaper use (we are on Baby #4 so far) we use them to bring a big load of wet clothes/towels home from swimming trips. So...being able to hold weight does matter to some people. 3. If we do need to replace the drawstring, the hole is large and would easily accommodate that. With daily use, over time these things wear out. It just happens. I don’t think it would necessarily need one if it sits in a pail it fits to the bottom in. 4. This accommodates a LARGE pail, wide on the top and on the botttom. I don’t necessarily need it to be so wide on the flat bottom (it doesn’t hurt anything), but if I did I would be thrilled to finally find one. Anything that makes diapering a little easier on a daily basis brings a little bit of joy, you know? Features I don’t like: 1. That the drawstring was too long. But that was such a simple fix to cut and seal with a lighter that it’s hardly worth mentioning. I love the grovia Paul liner. I was also super impressed with the processing and shipping time. I would purchase from green mountain diapers again!